Costa Rica got it right! About 25% of the country is designated as national parks and protected areas. That, combined with tropical climate, supports a rich variety of flora and fauna for outdoor enthusiasts to enjoy. 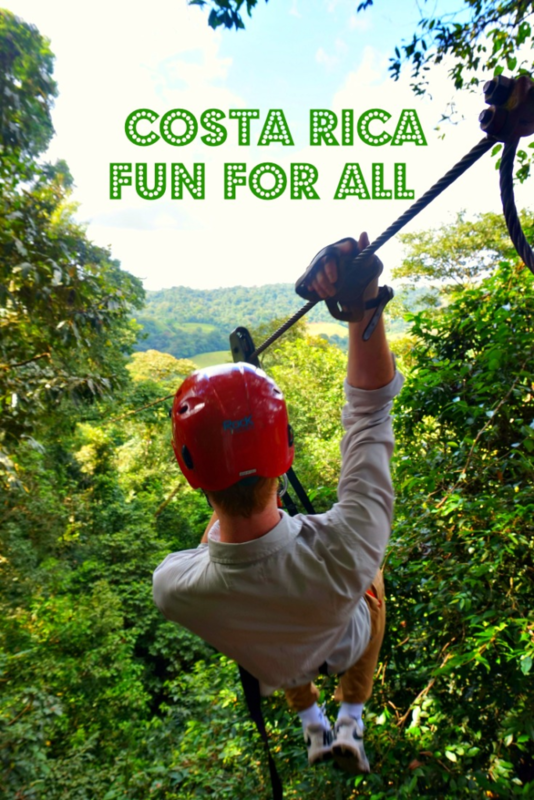 Visitors seeking action adventure will find numerous thrilling activities like white water rafting, zip-lining above cloud forest, cliff jumping and more. But if you prefer to simply relax on the beach or watch a spectacular sunset from an infinity pool, it is all there for you too. With my trip to Costa Rica, I crossed another destination of my bucket list. I had an entire itinerary in my head for at least five years and was waiting for a good deal to come around. It finally happened. Travel dates were not perfect, departure on New Year’s Eve, but I still jumped on it. I was able to secure two round trip tickets with AA credit card opening bonus. The lucky winner to join me was my 22 years old son, Daniel, who could easily fit this vacation into his college Christmas break. Costa Rica sounded so attractive to him, he agreed to spend so much time with his mother! One of the most difficult tasks of the trip was to keep my mouth shut because parenting a young adult could be very challenging, but we both managed to stay cool (for the most part!) and have a lot of fun along the way. San Jose serves as entry point for majority of visitors to the country. Many hotels are located close to the airport and offer a comfortable place to sleep. I chose Costa Rica Marriott San Jose for its attractive architecture and outstanding facilities. I wanted to spend New Year’s Eve and New Year’s Day in a nice place. I used all my valuable Marriott points for these two nights but it was worth it. This hotel could be a destination on its own. There were a lot families with kids all ages having good time in the pool, hot tub, or at driving range. I also meet a lot of older people who come to escape winter. They enjoyed early walks, reading by the pool, and of course delicious food and drinks. Many sightseeing and adventure day trip are available from San Jose. 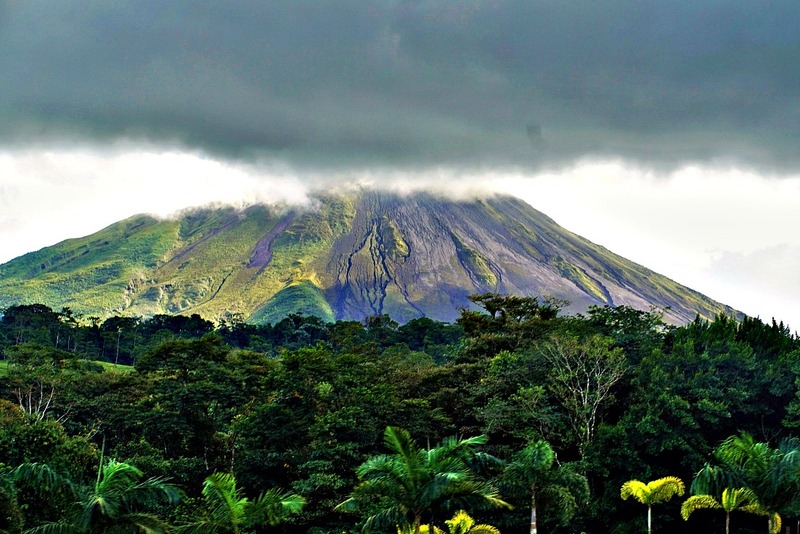 La Fortuna, just two hours from San Jose, with its famous Arenal Volcano as a major attraction, is a destination for adventure seekers. Hiking, kayaking, zip-lining, canyoning, and white water rafting are very popular in the area. 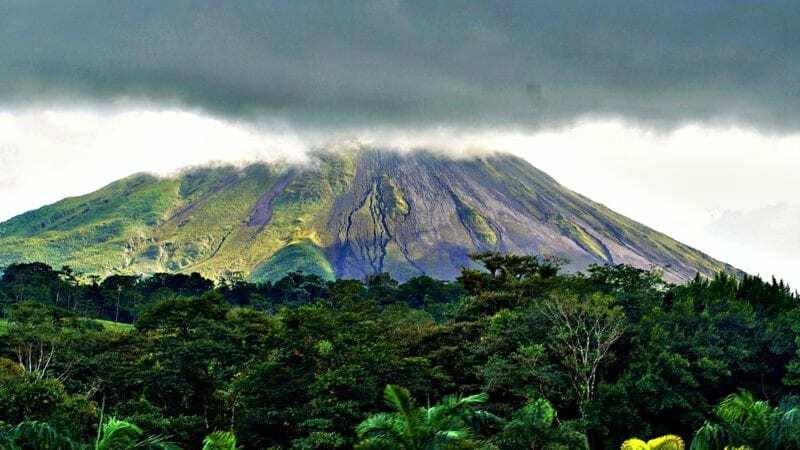 We stayed in Hotel La Fortuna where for around $80 per night you can get a center location, a small balcony facing the volcano, and a free breakfast. It was a nice clean place to spend a night after a long day of activities. Center of La Fortuna was overflowing with American college kids. Many of them stayed in inexpensive hotels like ours or in nearby hostels. They came for action, not for facilities. But there is an entirely different face to La Fortuna. 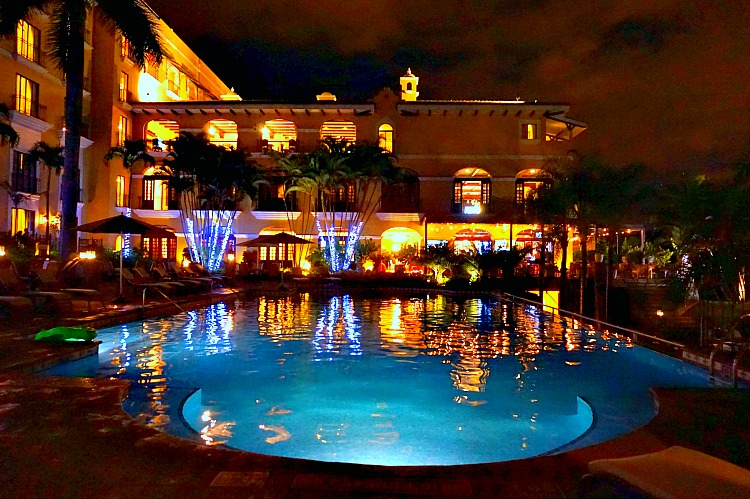 Farther from town, you will find upscale hotels many with their own impressive thermals pools appealing to families. If you have limited time in Costa Rica, this is a place to visit. It offers outstanding scenery, abundance of wildlife, gorgeous beaches, and all sorts of accommodation. This is a place for visitors of any age. Young children will love the beach and animals watching while older ones will enjoy zip-line tours, jet skis, parasailing, and more. The area offers a variety of lodging from hostels to upscale hotels. It is also known for its diverse rental market from small studios to huge beautiful houses that accommodate up to 30 people. Some of these properties come with their own cook! 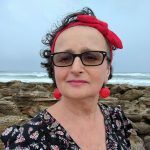 We stayed at Hotel El Faro Beach which for a reasonable price offered what I was looking for – a killer view of the Pacific from a private balcony, infinity pool, and an open air restaurant with a la carte breakfast included. 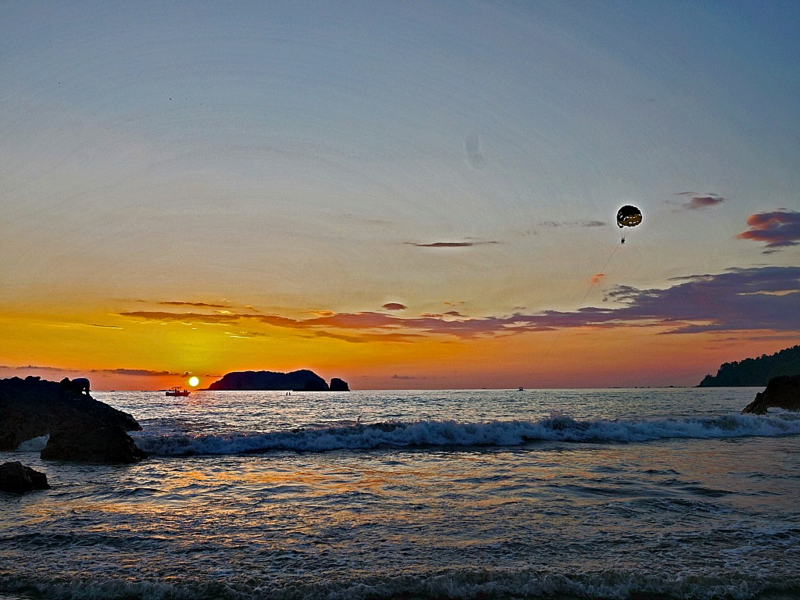 Number one attraction of the area is Manuel Antonio National Park open from 7 a.m. to 4 p.m. Be there at seven to avoid crowds and heat. For $40 we took a private tour. It was well worth it. We saw monkeys, sloths and a variety of birds. Beaches at the park are gorgeous. 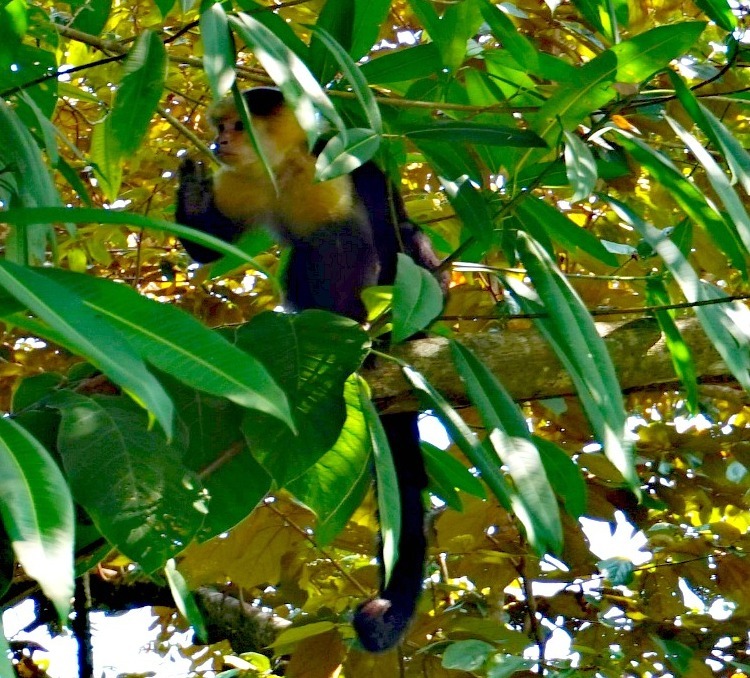 Later at the day they get crowded with people and …monkeys! From what I heard, they steal people’s stuff and are very skillful at that! 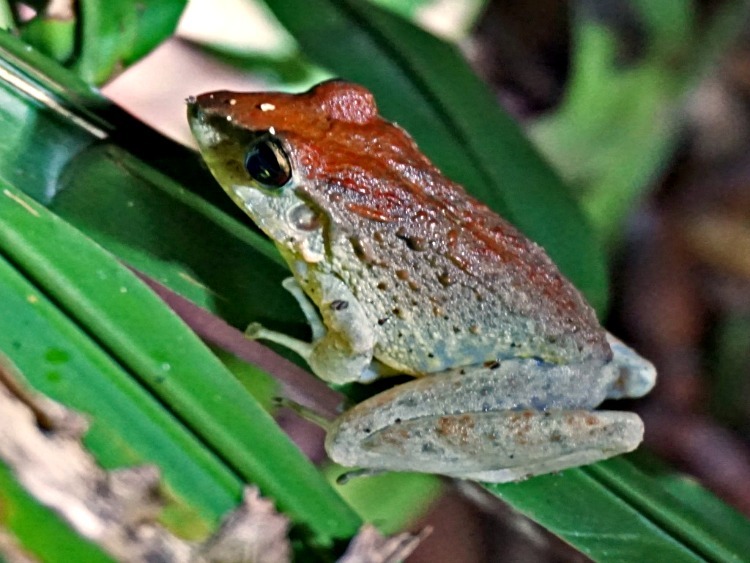 We have seen even more animals on a mangrove tour – a great tour for entire family. You can take a guided boat ride or kayak on your own. We took a boat. Monkeys were very active that day. 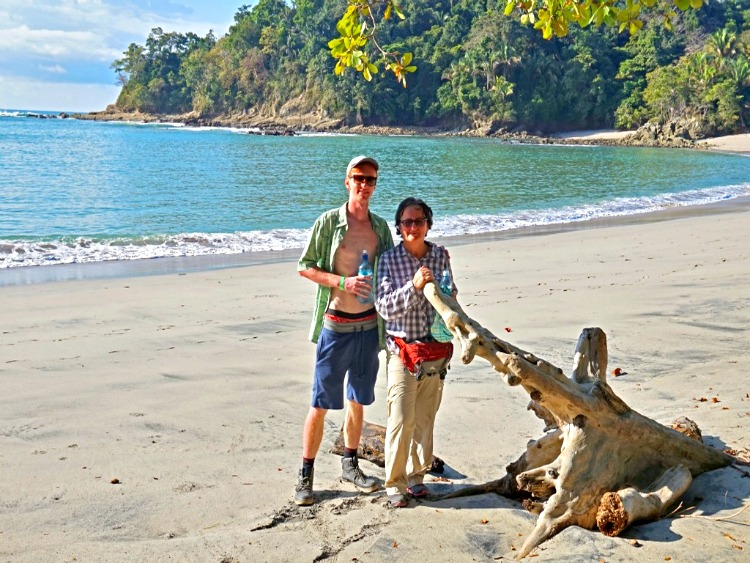 Another tour we took in Manuel Antonio was a guided night tour of the rainforest. We saw a lot of night creatures. It was one of a kind experience but not suitable for young children. Wow! That shot of La Fortuna is beautiful!! This definitely makes me want to check out Costa Rica.